This ring displays the masterful creations that can be created with modern knowledge. 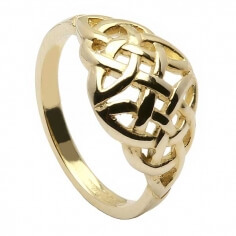 This Celtic knot ring is amazingly simple and would be lovely on any woman's finger, but it still retains the immaculate complex design of the Celtic knot. Available in sterling silver or gold, this ring really does pack a punch. 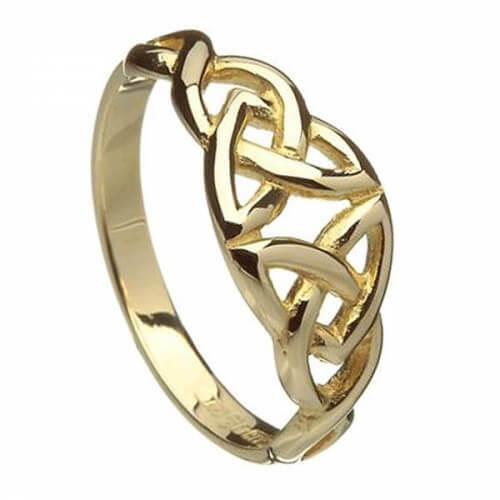 The Celtic knot has many meanings - many of which have to do with eternity and continuation because of the knots lack of beginning and end. This ring is perfect for the woman who loves deeper meanings in quaint packages. There is little history known about the Celtic knots because practically nothing was written down. It is known that they started to appear in history around 450 AD. All Celtic knots are normally also known as endless knots. This is because they have no beginning and no end. This is where most of their symbolism has come from, and why many people associate them with forever. The idea that these knots are endless represents the Celtic association with nature, and the belief that they identified their spirits in nature. That is why one of these knots, the Trinity or Triquetra, is believed to be associated with the mind, body, and spirit. 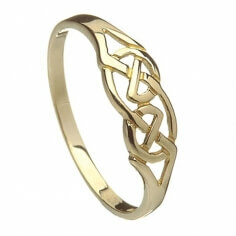 Those who have studied the knots and Celtic heritage say that the knots are a representation of their beliefs. Just like the Celtic Gods, the knots are a representation of the endless cycle of birth, death, and rebirth. There is only the continuation of the cycle. It is seen not only in the actual birth of people, but as the Celtics saw it, nature.